The snow on Titus Ridge north of Ketchum shows signs of remotely triggered avalanches on Friday, Dec. 30. 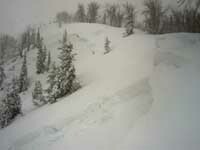 Photo courtesy of Sawtooth National Forest Avalanche Center. Unstable snowpacks resulted in avalanche deaths across Montana, Wyoming and British Columbia over the holiday weekend, and one particular slide killed a prominent conservationist just south of the Wyoming border. David Gaillard, Northern Rockies representative for Defenders of Wildlife in Bozeman, was killed by an avalanche while cross-country skiing near Pilot Peak in the Shoshone National Forest on Saturday. Park County officials told The Associated Press on Saturday that Gaillard had been skiing with his wife, who was not buried in the slide. The Associated Press said Gaillard and his partner had been traveling on flat ground in the North Absaroka Wilderness in Wyoming when he was engulfed by an avalanche that swept down a nearby slope. "The avalanche danger was so bad that you were able to trigger avalanches from flat terrain," Doug Chabot, director of the Gallatin National Forest Avalanche Center, said Saturday. Chris Lundy, director of the Sawtooth National Forest Avalanche Center, said conditions in this region are similarly dangerous. The avalanche that killed Gaillard was known as a 'remote trigger' slide, he said. "They weren't necessarily on the slope that avalanches, but they were connected to it," he said. Lundy said it's likely that the skiers fractured the snowpack on the valley floor, a fracture that resonated up the slope and brought a slide rushing downhill. He said such an event is possible in the Sawtooth National Forest with current conditions. "It could [happen] right now," he said. "It's less likely than it was a few days ago." After last week's wet Pacific storm dumped 25 inches of snow on Galena Summit, the avalanche danger skyrocketed as the new snow refused to bond with the existing weak snow layer. As a result, the center urged backcountry adventurers to stay away from all slopes steeper than 30 degrees. "Just because you're on the flats, if there is a steep slope above you, you can trigger an avalanche," Lundy said. Lundy said fellow forecaster Blase Reardon triggered multiple slides on Titus Ridge on Friday, the same day that a natural avalanche blocked state Highway 75 at the pass. "It was the remote trigger situation," Lundy said. "[Reardon] was never on a steep slope, but just walking along a ridge, he triggered slides. Conditions are that dangerous—you can trigger avalanches above you and below you." Weak snow has even been a problem on Bald Mountain, where Rich Bingham, snow safety director for the Sun Valley Ski Patrol, said crews have had to eliminate a few pockets of deep snow that showed signs of weakness. "It was enough to bury someone for sure," he said. Bingham said the pockets were not terribly serious, and now that they have been eliminated, snow conditions in the ski area are more than safe. "On Baldy, we're looking good," he said. "We're ready for more snow." Lundy said the backcountry skiers he's seen are being conservative with their terrain, perhaps because of the widely publicized danger. "Just looking at tracks when I was out today, people have been making pretty good, pretty safe choices," he said. However, Lundy said he expects to see fewer backcountry recreationists making conservative choices, as snow pits dug to test stability show fewer prominent signs of weakness. "This is the time people are being lured into steeper terrain," he said. "It's becoming a stubborn problem, where there are less obvious signs of stability. But the layering isn't going away."